Are you a snacker or do you prefer sticking to three meals a day? I gotta say I would love to be more of the latter, but I definitely fall into the snack-person category. I am always hungry, and whether it's due to the fact that I get quite a bit of exercise or that I prefer eating smaller meals, I love to snack. Anything from raw veggies to nuts, seeds and dried fruit is on top of my snacking list, but lately, with the cool weather hitting Sydney, I've found comfort in warmer snacks. That is exactly why this particular treat is my favourite - warm roasted almonds dressed in delicious rosemary and olive oil. It makes a perfect antipasti too, and you could easily use walnuts or any of your favourite nuts for this. Try adding garlic and dried chilli flakes in the mix as well, they are fabulous in this! And the ultimate snack alongside with this one? Roasted rosemary. You gotta try it - it's simply delicious! 2. 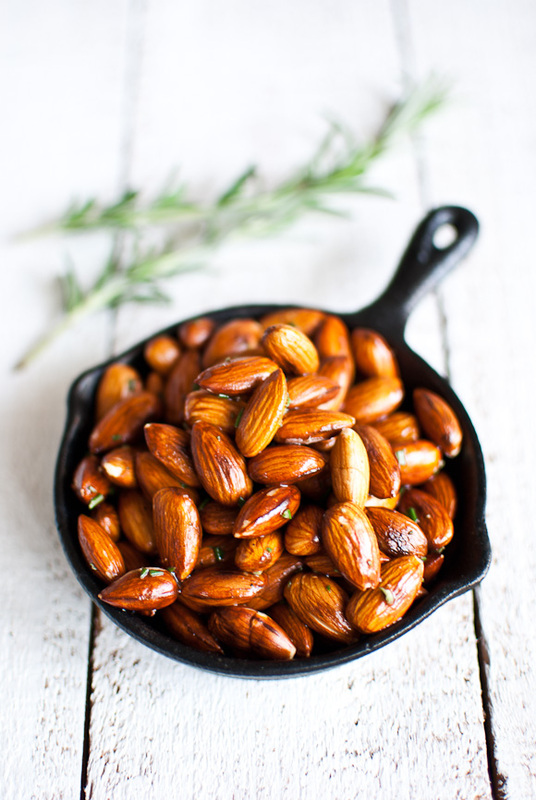 Place the almonds on a roasting tray with a few sprigs of rosemary and roast for 10-15 minutes or until the nuts are browned. Be careful not to burn them! 3. Place the nuts in a bowl with the finely chopped rosemary and olive oil. Season with salt and pepper and toss well to coat. Serve with the roasted rosemary as a quick snack or as antipasti. These look lovely!! I'm a snacker - definitely need an afternoon snack! Mmmhh, addictive! Those almonds must taste so good. Look at those lovely plump almonds! Yum. wow, these look awesome. I'm making them almost the same way you do, but yours definitely look better! Your photos (and recipes) are always sooo good! it just pops out of the screen! These almonds look so lovely! I am also a snack person with hopes of one day becoming a three meals a day person. These almonds look delicious! Beautiful light! These look like a fantastic midday snack :). mmmmm.... I'm such a snacker and these look delicious! Love almonds. Love rosemary. This has my name on it for sure. Lovely macro photos of those almonds. They jump off the screen. I'm a snacker too and almonds are one of my favorites. I'm a big time snacker too, and prefer small meal to keep my blood sugar level through the day. These nuts would probably make a great foodie gift around the holidays too! Your beautiful pictures of almonds are not shy at all to have that close-up shot! They show well how delicious these simple almonds are! Nope, eat four meals a day with no snacks at all - BUT, these are so simple to make and so original and sound so moreish - next time I pour friends a glass of wine or three, will rob my rosemary bush and reproduce this to no doubt great acclaim! I'm definitely a snacker. Thanks for the recipe! yum! Love nuts, almonds, pistachios, you name it! Never tried them this way and rosemary is such a strong flavor, goes so well with them. Mmm I love almonds, but your way of treating them makes them look even better! A terrific snack, nice with rosemary! I'm an avid snacker (as my waistline shows) and these look simple enough for even me to make! In general, I don't snack SO much, but I'm sure that would change if I had these babies around! I can see myself snacking on these. How yummy! What an easy and creative treat Maria! 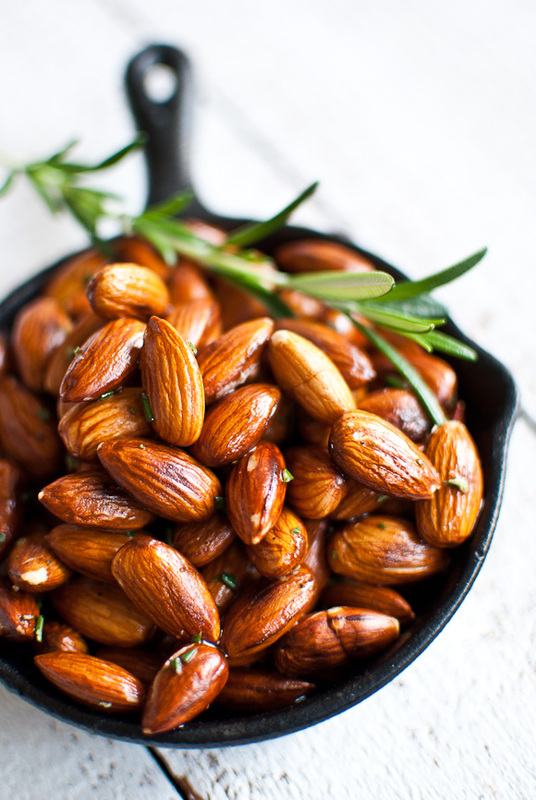 Rosemary & almond sounds like a fabulous flvour match! I'm definitely a snacker. I've never roasted my own almonds before but I would love something like this. And esp with dried chili flakes! Genius! Love this snacky idea! I am a snack person .. need it every evening with tea :) This looks addictive and so easy to make. This looks so good! 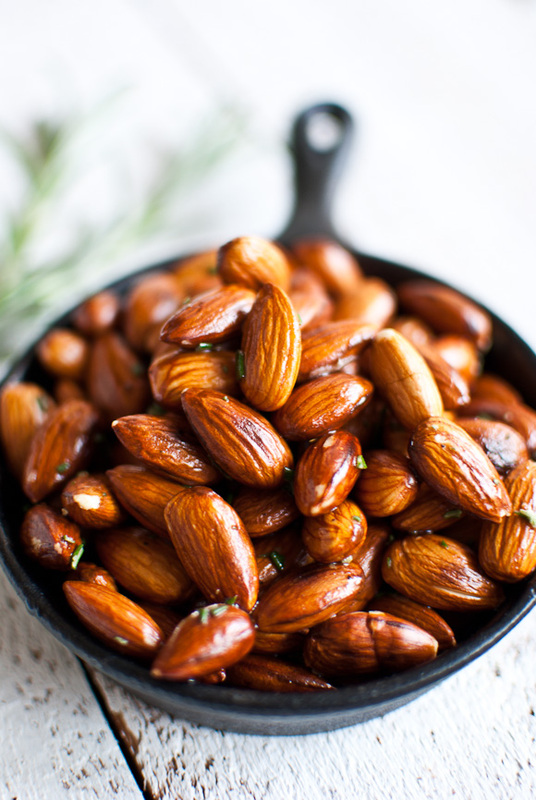 I love the texture of roasted almonds and yes, I love to snack too! My sweet husband is always asking, do you need a snack? Thanks for sharing, Maria! Perfect munchies for an art reception. Just serve in candy cups or mini-cupcake liners.... if there are any left to share! Beautiful Maria! I fall into the "eat all the time" category. The almonds look tasty! Don't apologize for being a grazer...it's far healthier to eat this way. You almonds look D.
I made these for Christmas Eve and they were divine! Making more right now for New Years! Thanks for sharing!!! Made these for Christmas Eve and they are divine. Making more right now for New Years. Thanks for sharing!! !